Published by:Erbauen Labs Pvt. 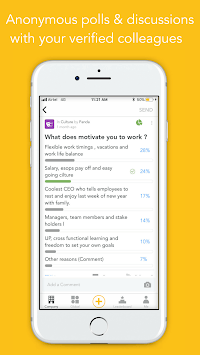 Ltd.
Hush is an app that aims to provide a voice to employees. It enables diversity of opinions in organizations. Discuss any issue without fear of retribution as all your posts are – Anonymous! An exclusive forum for you and your verified coworkers to voice their real opinion. The forum is Anonymous to enable each opinion to be looked at in insolation without connecting it to the individual. a> Discuss Increments, Company Strategy, Layoffs, Promotions. b> Give "Bravos" to your peers. c> Upvote what questions your CEO should answer every week. b> You may want know how much salary people at other companies get? Just ask. c> How the culture is in a particular company? Or you want to join the product team somewhere and want to find out if that will be a good move for you. You will get answers from verified employees of those companies. 3> Groups: Hush allows you to create or join groups. 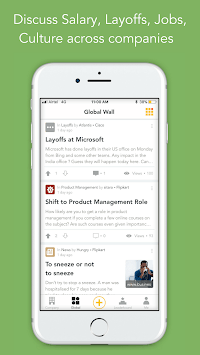 You can create public or secret groups within your company wall or on the global wall. All discussions in groups are also anonymous. All Hush users are verified employees of various companies. 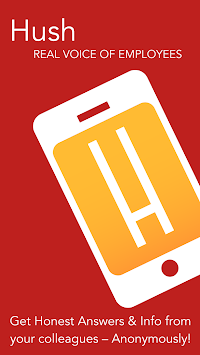 You are allocated a random anonymous handle when you install the app. No one can find out your real identity. Not even the Hush team! Hush is the Real voice of employees. Salary module - Find out salary levels in various companies and compare your salary. Career Advice - Articles and blogs with career advice. Faster app launch time, other performance improvements and bug fixes.